Created in March 2013 to mark the 200th anniversary of physician and epidemiologist, John Snow who traced the source of cholera in London in 1854, the Museum of Water travels from place to place accepting donations (and stories) of all kinds from tap, rain and snowball water to trumpet spit and a sample from an Antarctic ice core. It is the invention of live artist, sculptor and filmmaker, Amy Sharrocks who has taken the museum on tour across the country, into Europe and in 2017 will venture to the southern hemisphere among other destinations. Here we find out from Sharrocks how the museum has continued to develop, remain interesting and keep on the move. How would you describe the success of Museum of Water and what have been the key factors in this? We are a different kind of museum. 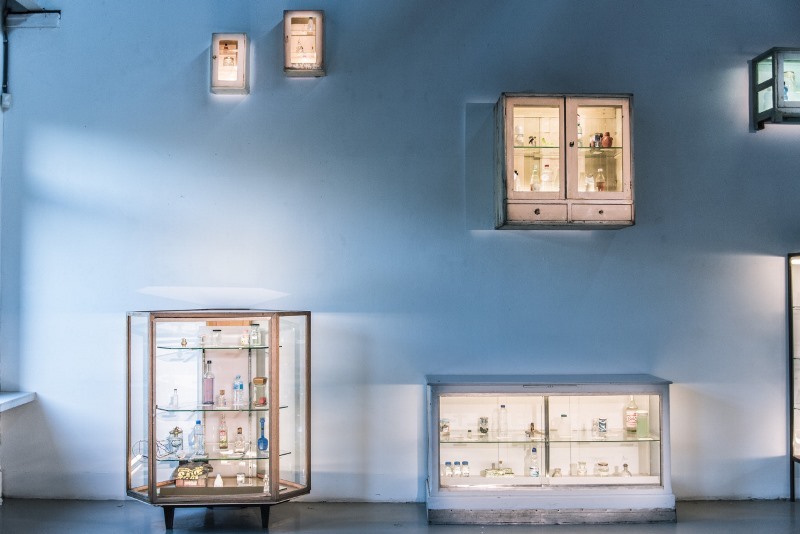 Museum of Water is a completely public collection of any water, in any bottle, and is made in collaboration with more than 700 donors now, and the Museum gives primacy to each person’s voice. We offer a challenge to the usual authority of museums, which in the past have been built on bequests from mainly rich, white, western men. The experience of this Museum is radically different. There is no hierarchy of knowledge here, no imposing atmosphere. It can often be chatty and loud. And because of the many places we have been, there is a huge diversity of experience cherished. Someone called it a ‘Mosaic of the Universe’, which I particularly liked. Museum of Water is both a live artwork and museum, a dual role which gives it extraordinary creative force. There are custodians who look after the water, explore the bottles and remember the phrases of people who come. It is a museum of Words as much as water, and is different every day. So you can add to the collection even if you didn’t know to bring water, and your words might get woven into a bottle’s history. Because your words matter. This full collaboration is an unusual offer from any Museum – It’s up to you what goes into it. Usually when you visit a museum you are a visitor, just that. Here you can become donor, curator, artist and protagonist. Here your journey makes a difference to the museum, here your words will be remembered, your presence counts – that is a very different relationship. Because the museum wholly relies on the public, you have a chance to influence the collection, which means that it matters whether you come or not. I don’t know other museums that do that. In what ways can Museum of Water engage with the public that a brick and mortar might not be able to? Museum of Water is itinerant. We travel because we know that others can’t. It takes a certain sense of privilege to cross a threshold, to enter a museum building that not everyone feels. We did not want to be in conversation with only a privileged few, we wanted to widen the discussion, so we have made a huge effort to get around, to represent. If we had stayed in one place, we might have had only one kind of visitor, so we deliberately travelled as widely as possible and installed ourselves in wildly different sites in order to meet as many different people as possible: canal towpaths in remote Welsh villages, river banks, schools, palaces, old people’s homes, botanical gardens, boats, markets and shopping malls, to name a few. 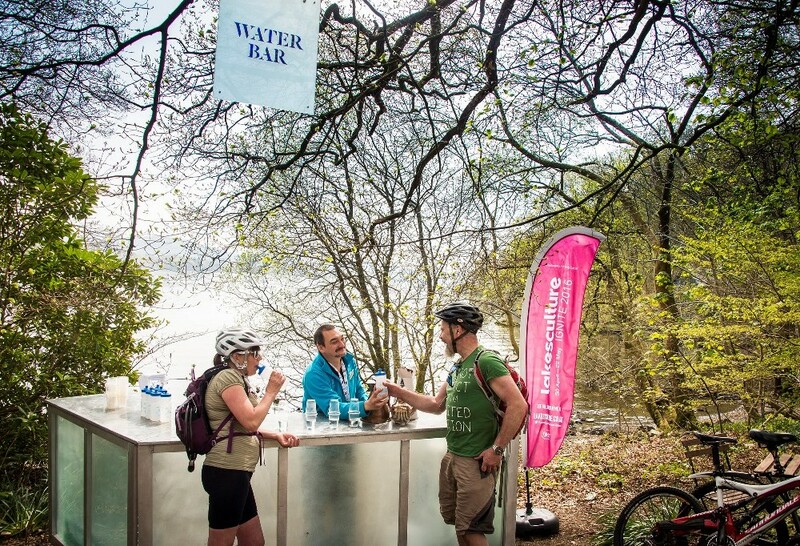 We have been to 40 different sites across the UK and into Europe, over 700 people have brought bottles and been visited by more than 30,000 people. We have loved being site specific each time. The spaces have looked very different, and have each had a different resonance. So in Birmingham, that most landlocked of British cities, we were in a derelict public slipper baths. Suddenly we began to chart the changing habits of public bathing in just one generation, as people came in and remembered their weekly family outing for a bath. Somehow the bottles people gave us here reflected a yearning for water, a sense of missing water: a disused canal, a closing swimming pool, a muddy puddle, water from a dehumidifier … whereas Brightlingsea for instance was full of beach huts, fishing, ponds and canoes, and Shoreham was sailing, seas, beaches & rivers, and living by the tides. How did it feel to be nominated for European Museum of the Year 2016? Blooming marvellous. It was a tremendous accolade and encouragement for the care we have taken and our different way of doing things. For years we have worked tirelessly to trace the impact of water across the British Isles, on the trail of a whisper of water words made public: a hesitation, an opening of experience, a loss, a precious moment, tracing something in the water. The Museum can be easily misunderstood, ridiculed even (“a Museum of Water, really?”), I think because it is dealing with something that is simultaneously exotic and mundane, rare and common, irreplaceable and dematerialising, priceless and cheap as chips (and cheaper). It seems like a dichotomy. But when you visit you realise that this plurality is actually its greatest strength: water is both one thing and another, both ignored, undervalued and abused, and a treasured and essential necessity of life, both real and metaphor. The water in the bottles is utterly specific and particular, and yet also one part of a whole, and arguably all the same thing. There are many local and global issues surrounding water – how have some of these been discussed and tackled through the Museum? Museum of Water is an act of witness to our days lived with water. We began in a year of devastating floods across England in 2013 where most of Somerset was underwater. We have travelled across Britain for two years, and this year we visited the banks of Lake Windermere just after the catastrophic Cumbrian floods as part of Lakes Ignite. As Britain underwent three ‘once-in-a-lifetime’ floods in as many years, we have borne witness to the impact this has had on people’s lives. At every site we build a rigorous cultural programme alongside the Museum for the serious investigation of water. We carve space for discussions of water issues and support a critical discourse to face the questions we will all encounter in the coming century. We have partnered with King’s College London and Leeds University, anthropologists from Oxford University and Denmark, poets, engineers, scientists, geographers, a catholic priest and the music ethnographer from the Pitt Rivers Museum. We have looked at the politics of water, the language of water, the sounds of water, our fiscal care as well as the seas of imagination. The Museum charts our water stories, both the shape of the water molecules itself, to the water management of cities and our rights of access to water. It is extraordinary to be making this piece across Europe at a time when the flood of refugees escaping from a drought and a water war in Syria is bringing into question the coping and caring strategies of different countries, questioning our kindness and threatening the borders and coalition of the European Union. I hope Museum of Water explores the boundary lines of our bodies and our thinking, and attempts to consider a more fluid way of understanding the world and our inter-relations. 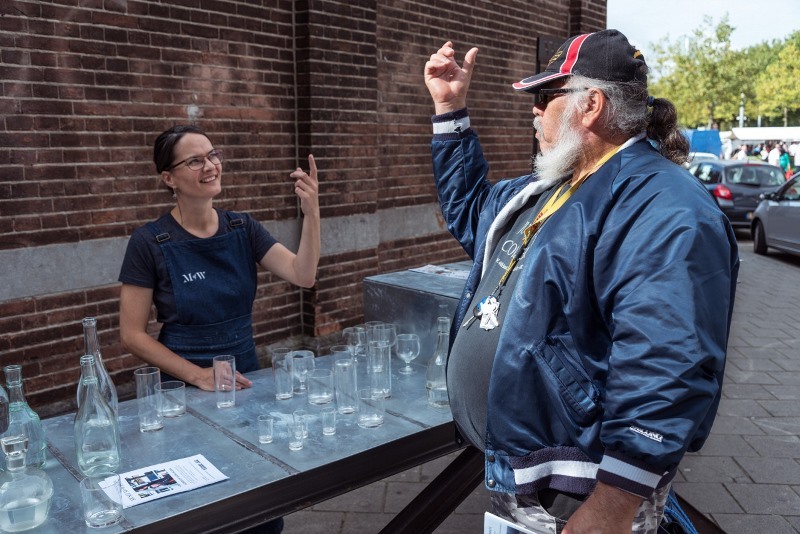 By inviting people to re-consider water for themselves, the museum prompts people to renew a bond that has been stretched thin over the years. 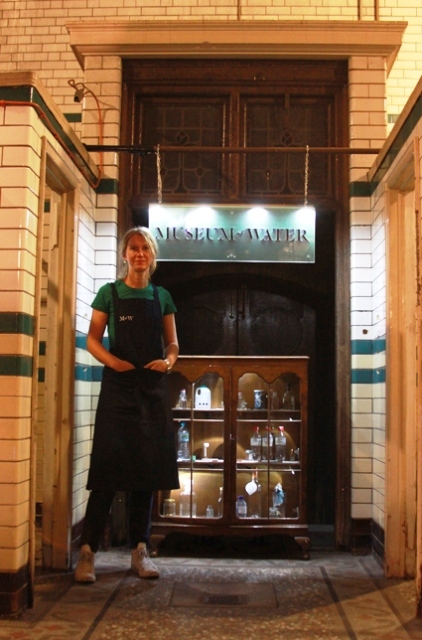 The Museum makes us all protagonists in our water history. There are many water questions facing us in the coming century and we are all implicated. 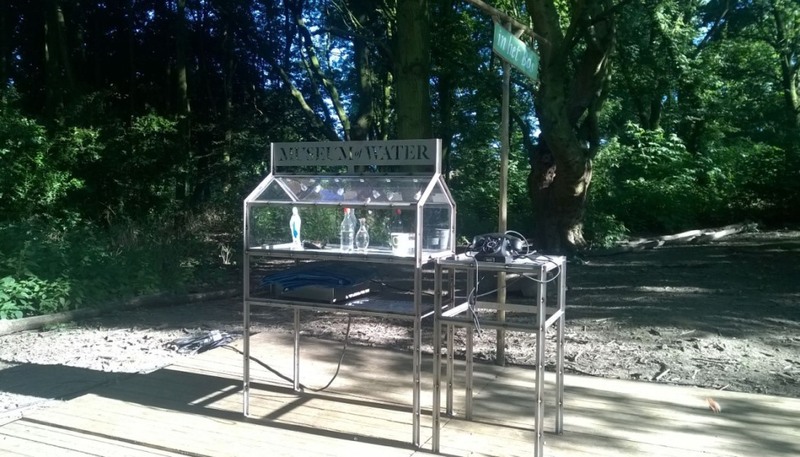 The Museum of Water has travelled around the UK and also into Europe and opened last month in Rotterdam with a large installation. How does the Museum change as it moves around, particularly in a European city? Being site-specific means that the Museum engages each time with the local and global questions of each city and its time. In Cumbria it was extraordinary to be there just after the floods, just as people were putting their houses and infrastructure back into some kind of order. There was a palpable feeling of trauma and of recovery. But we were in an 18th century boathouse on the banks of Windermere, the deepest lake in Britain, an extraordinary landscape carved by water. So the experience of shock and revival was underpinned by a strong sense of a longer-term existence. Last month we were in Rotterdam, where half the city is below the water table. The Netherlands has used water as an extremely successful flood defence system for centuries: if anyone tried to invade, they could flood vast tracts of land and literally make it impassable. This is the Hub of Europe; the harbour itself has its own mayor. The area of South Rotterdam where we are based is the most diverse neighbourhood in the whole of The Netherlands, with 143 nationalities. It made no sense to come here with our English front room cabinets. Our references, histories and aesthetics are different. I am not interested in repeating a colonial paradigm, where I ship out the water already gathered and tell people what I know. I like to work in full collaboration, to be as influenced by other people as they might be by me. We are all in it to learn. The British collection is wondrous and extraordinary, but in conversations with The Rotterdamse Schouwburg, none of us wanted to ship out the collection we had, like so much sculpture; we were all much more interested in building a new collection, that spoke directly of Rotterdam, was grown organically and is in strong connection and full collaboration with the city. What was the original concept of the museum, how has it developed, and what is its future? The museum asks simply, how do you feel about water? I wanted to look again at something people seem to overlook constantly. With a twist of our hand we turn a tap or flush a lavatory, content in our ignorance of where it comes and goes from, happy to not have to think about it. We seem to think we are in charge of it, but we are vulnerable. The museum was a way of beginning a conversation. Through the variety of places we’ve been and the amount of people we have met, the museum has become many more things: a reason for gathering, a space for performance, an instigating site, a museum of public history, a reed bed for experience, an archaeology of the future. The museum operates in a context of water issues facing the world and the people in it. It has become unexpectedly crucial, with huge relevance for our future. What have been the highlights of Museum of Water since its inception? There have been so many highlights. I really treasure the opportunity to explore the world and the people in it, each site a new beginning, full of risks and possibilities. I have had the pleasure to meet and work with many brilliant people. One of my favourite moments is sitting down with someone new to the museum, when they put their bottle on the table in front of us and I get to ask, “What’s in your bottle?” I love the journey each person takes me on, the possibilities of it all and the elaborate-ness of the potential. Every single bottle is different, and it is impossible to imagine what people might bring. I love the process of trying to look carefully at something together; often the answer is a surprise to us both. There is a deep pleasure in learning from other people. At the heart of the museum is a feeling of reciprocity, of give and take. We are all in dynamic process – the bottles make this very clear – with the world and each other. If the water evaporates, where does it go – in you? In me? – What you breathe out, I breathe in. My faith in our approach has strengthened over the years. I am bolder with this process of taking risks, of being brave enough to be open to influence. Museum of Water is a declaration of inter-dependence.